Serve sushi like a pro using our sylish bamboo plates or melamine boat. Divide your sushi with a grass divider. Rectangle bamboo sushi plate. 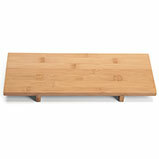 This classic sushi serving platter is made with lightly lacquered bamboo. 12 x 4.5 inches. Made in China. 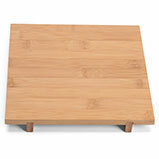 Bamboo square sushi serving plate. Classic design, made with lightly lacquered bamboo. 8 x 8 inches. Made in China. 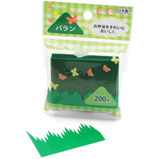 Pack of 200 restaurant-style green plastic food divider leaves. Of course connoisseurs will carve their own baran from bamboo leaves but for us less-skilled sushi lovers these plastic versions add a fun addition to your sushi parties. Each baran is 3 by about 1.5 inches. Made in Japan. Serve your sushi fresh off the boat! 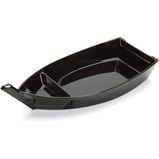 Gloss black lacquered plastic sushi serving tray in the shape of a boat. 11.5 x 5.5 inches. Made in Japan.